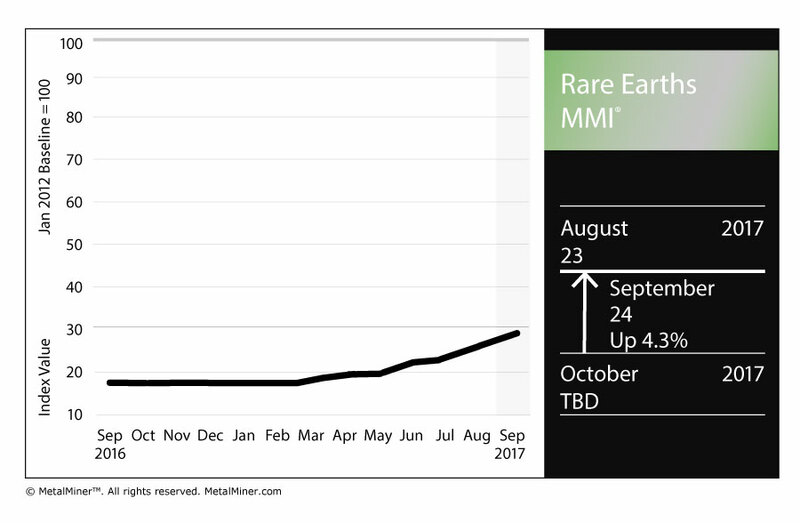 The Rare Earths MMI ticked up one point for a September reading of 24. After hitting 29 in April 2015, the sub-index fell as low as 16 last year before slowly climbing back up this year with an uptrend that began in March. For this MMI period, several of the sub-index’s heavy hitters posted strong months. Chinese terbium oxide rose 2% and Chinese dysprosium oxide rose 5.6%. Neodymium oxide rose a whopping 35% in the month. An overwhelming majority of rare-earth metals production comes from China, and the metals are crucial for use in things like computers, phones and other electronic devices. Reuters’ Andy Home recently wrote about the topsy-turvy world of rare-earth metals prices. Rare earths have come a long way since the market collapsed underneath them in 2012. The Financial Times reported last month that the price of two rare earths, neodymium and praseodymium, has jumped by more than 50% this year. In short, Chinese policies significantly impact the direction of the global market. The question, as it often is with the rare earths market’s peaks and valleys: when is the next valley?